In the Mossel Bay area you will find the Cape St Blaise lighthouse that was built in 1864. Close to the lighthouse is a cave. This is known as the Cape St Blaise cave and it is where Bartholomew Dias met some live-stock farmers, known as the Attaquas. This cave has been declared a national monument and archeologists report that the cave was used by the Khoi San communities from as far back as 100 thousand years ago. The cave can be reached from the parking area of "Die Punt" and has pedestrian routes clearly marked with signs. 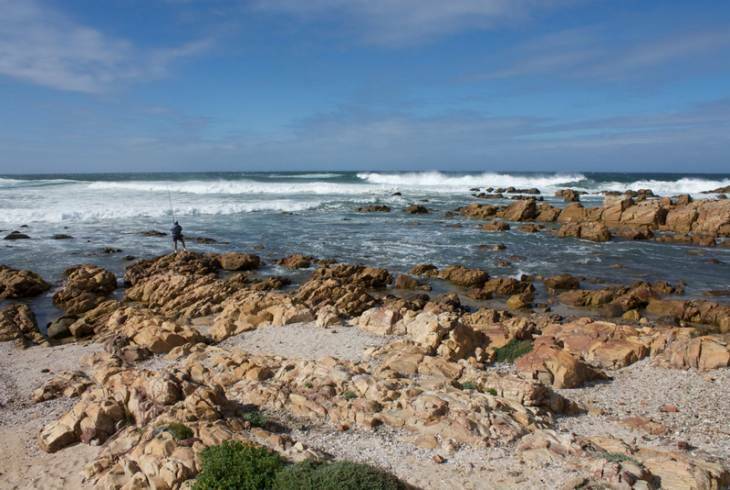 Other beaches in the Mossel Bay area are the "Bakke", Pansy Beach, Dias beach, Kwa Nonqaba and Reebok. Hikers may be interested in the Ruitersbos Forest Walk, as laid out by the Department of Forestry. Follow the R328 road north as you leave the Mossel bay area to get to the Eight Bells Mountain Inn, which is the official start and finish of the hike. The paths are marked in yellow for a more relaxed walk, and in white for the fitter hikers. If you are interested in flowers, be sure to visit the Robinson Pass, to the north of the Mossel Bay area, also on the R328. The pass was built in 1886 by Sir Thomas Bain. The road is flanked by pine forests and the hillsides are covered with fynbos. South Africa's national flower, the Protea , blooms in this pass from May to July and it is a spectacular sight due to the contrasting fractured rock and deep gorges in the background. Mossel Bay Area overview. Mossel Bay Area Accommodation and Information.